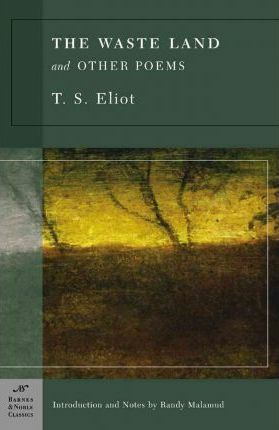 The Waste Land and Other Poems, by T. S. Eliot, is part of the Barnes & Noble Classics series, which offers quality editions at affordable prices to the student and the general reader, including new scholarship, thoughtful design, and pages of carefully crafted extras. Here are some of the remarkable features of Barnes & Noble Classics: New introductions commissioned from today's top writers and scholars Biographies of the authors Chronologies of contemporary historical, biographical, and cultural events Footnotes and endnotes Selective discussions of imitations, parodies, poems, books, plays, paintings, operas, statuary, and films inspired by the work Comments by other famous authors Study questions to challenge the reader's viewpoints and expectations Bibliographies for further reading Indices & Glossaries, when appropriateAll editions are beautifully designed and are printed to superior specifications; some include illustrations of historical interest. Barnes & Noble Classics pulls together a constellation of influences-biographical, historical, and literary-to enrich each reader's understanding of these enduring works. Considered the most important poem of the twentieth century, T. S. Eliot's The Waste Land is an oblique and fascinating view of the hopelessness and confusion of purpose in modern Western civilization. Published in 1922-the same year as Joyce's equally monumental Ulysses-The Waste Land is a series of fragmentary dramatic monologues and cultural quotations that crossfade into one another. Eliot believed that this style best represented the fragmentation of society, and his poem portrays a sterile world of panicky fears and barren lusts, and of humanbeings waiting for some sign or promise of redemption. Mirroring the destruction and disillusionment of World War I, The Waste Land had the effect of a bomb exploded in a genteel drawing room, just as its author intended. This volume also includes Prufrock and Other Observations (1917) and Poems (1919). Prufrock contains the poem that first put Eliot on the map, The Love Song of J. Alfred Prufrock, in which the title character is tormented by the difficulty of articulating his complex feelings. Among other masterpieces, Poems features Gerontion, a meditative interior monologue in blank verse-a poem like none before it in the English language. Randy Malamud is Professor of English and Associate Chair of the department at Georgia State University. His specialty is modern literature, and he has written three books and numerous articles about T. S. Eliot.